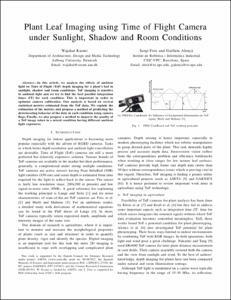 Kazmi, W.; Alenyà, G.; Foix, S.
In this article, we analyze the effects of ambient light on Time of Flight (ToF) depth imaging for a plant’s leaf in sunlight, shadow and room conditions. ToF imaging is sensitive to ambient light and we try to find the best possible integration times (IT) for each condition. This is important in order to optimize camera calibration. Our analysis is based on several statistical metrics estimated from the ToF data. We explain the estimation of the metrics and propose a method of predicting the deteriorating behavior of the data in each condition using camera flags. Finally, we also propose a method to improve the quality of a ToF image taken in a mixed condition having different ambient light exposures. Kazmi, W.; Foix, S.; Alenyà, G. Plant leaf imaging using time of flight camera under sunlight, shadow and room conditions. A: IEEE International Symposium on Robotic and Sensors Environments (ROSE). "Proceedings of the 2012 IEEE International Symposium on Robotic and Sensors Environments". Magdeburg: 2012, p. 192-197.